Eric Hosmer is a free agent after this season. Maybe the most interesting free agent of the upcoming winter. If you are an unnamed scout who talked to Jon Heyman back in spring training, you think Hosmer should get far more than the 5 years/$73 million Brandon Belt got as an extension from the Giants, because anyone who thinks Belt is better than Hosmer should “get a grip”. The old $200 million rumor is so ridiculous we don’t even need to bother addressing it, but as Jeff wrote in February, it wouldn’t be that hard for a team to rationalize their way into a deal for more than $100 million if they believed a few things that aren’t entirely unbelievable. But, as a counterpoint to Jeff’s perfectly reasonable post, I’d like to present a leaderboard that offers another perfectly reasonable position; the one that just acknowledges that Eric Hosmer isn’t very good. Our leaderboards offer the super-nifty past calendar year function, which allows us to look at how everyone has performed over the last 365 days. This helps account for recent production without just looking at small-sample 2017 numbers. 22 first baseman have racked up at least 500 plate appearances from April 20th, 2016 through April 20th, 2017. Here they are, sorted by offensive runs above average. Marwin Gonzalez keeps Hosmer from being the very last name on the list, but Gonzalez has only gotten enough time to qualify for a 1B leaderboard because the Astros other first baseman have been lousy and/or injured. He’s a utility infielder by trade, and has played more innings at shortstop than any other spot during his career. If we excluded Gonzalez on account of the fact that he’s not really a first baseman, than it would be accurate to say that Hosmer has been the least productive offensive first baseman in baseball over the last year. He does rank ahead of Joe Mauer and Travis Shaw in wRC+, but his inability to advance on the bases and his double play tendencies have pulled him down enough to rank behind both in overall offense. On the latter point, he’s hit into 22 double plays over the last year, tying him for fifth-most in baseball. It’s one thing to endure a lot of twin killings because the upside is Miguel Cabrera in your line-up or Yadier Molina behind the plate, but Hosmer is combining bottom-of-the-barrel double play frequency with below average batting. That’s a rough pair. To put Hosmer’s batting line (.2561/.321/.415, 96 wRC+) over his last 160 games into context, here are the other three players who have posted a 96 wRC+ since last April 20th: Mitch Moreland, Nick Markakis, and Ender Inciarte. Denard Span is one tick below with a 95 wRC+. Jacoby Ellsbury is one tick above, with a 97 wRC+. Yankees fans have spent the last few years calling Ellsbury’s contract one of the worst in the team’s history; Hosmer has spent the last year hitting like a version of Ellsbury, but one who also happens to not be able to run or play anything other than the easiest position on the field. At this point, it’s not entirely crazy to suggest that Hosmer and Moreland are somewhat comparable players. Here are their lines over the last year. Hosmer strikes out a bit less, but Moreland hits for a bit more power. Overall, though, pretty similar. Think just looking at the last year is unfair? If you go back to April 20th of 2015, over the last two years, Hosmer has a 109 wRC+ versus the 106 wRC+ that Moreland has put up. Last 3 years? It’s 106/102, with Hosmer still holding a slight lead. Hosmer is younger, hasn’t been platooned, and still has those enticing exit velocity numbers. As Tony Blengino noted in his first base write-up over the winter, there is real data suggesting that Hosmer could be significantly better than he has been if he made some changes to his swing. I remain a big-time Eric Hosmer supporter, but at some point he needs to ramp up that fly-ball rate; it’s all that stands between him and greatness. His grounder rate has never been lower than the 77th percentile among AL regulars. He’s hurt by his home park in the air, and was unlucky on liners (94 Unadjusted vs. 119 Adjusted Production), but his BIP type-specific Adjusted Production scores are strong across the board (158 Fly, 141 Grounder). It’s all about BIP mix moving forward. You want a guy who could become an MVP candidate overnight with relatively simple swing adjustments? Here’s your man. But Hosmer is now 27 years old, nearly 4,000 plate appearances into his big league career, and in his contract year, he’s started the season by hitting .193/.270/.263 with a 57% groundball rate. He has two extra base hits so far this season, because as usual, he’s just hitting everything on the ground. 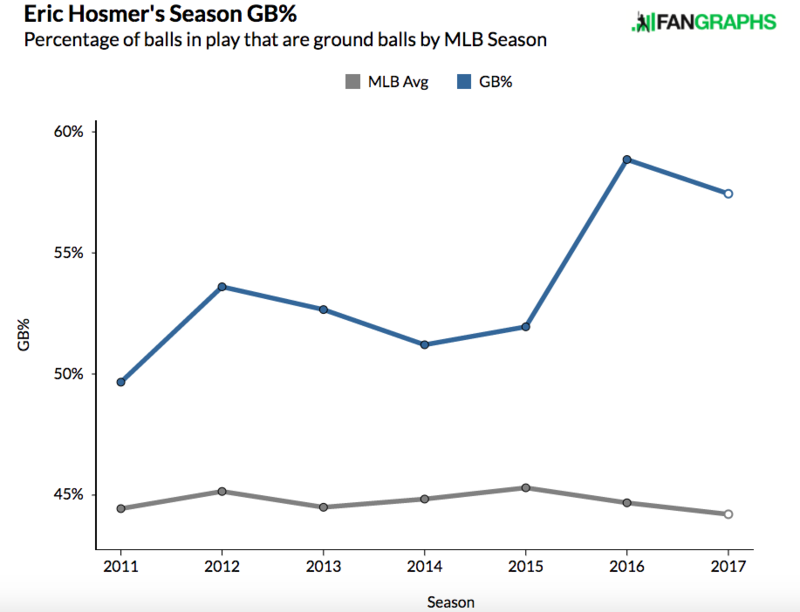 There’s no evidence that Hosmer has made any efforts to revamp his swing to take advantage of his contact-on-fly-ball authority. If anything, he’s going the wrong way. So, yeah, Hosmer still looks like a guy who could be good if he joined the elevate-and-celebrate crowd, but based on actual results, Hosmer currently isn’t all that different from Mitch Moreland, who signed a one year, $5.5 million contract this winter. And over the last year, he’s actually been the worst offensive everyday first baseman in baseball. If Scott Boras hopes to land the big contract he’s argued Hosmer deserves, than he’s going to need his client to start hitting, and soon. Because right now, Hosmer looks like a guy who should consider taking the qualifying offer. We hoped you liked reading A Leaderboard of Interest to Potential Bidders for Eric Hosmer by Dave Cameron! You must be assuming he’s going to get back to 3-WAR territory, because if he’s still above the Mendoza line you’re looking at a one-year deal at best. He also had negative fWAR in 2012 (-1.7! ), and 0 fWAR in 2014. Forgive my ignorance here but if he’s so (below) average why would a team want to pay so much for him? What would he add to the team other than taking up critical pay roll? he’s a white player with a “good face” who ever since he was drafted, has received constant praise and hype from baseball media out of line with on-field performance; His pre-draft scouting reports are still paying dividends for him. He’s also someone management can be “comfortable” signing for whatever reason. Bringing race into the conversation out of nowhere is bush league nonsense. Race only ever comes “out of nowhere” to white people.